Adding more to their functionality than just beautification, NASA research has found, additionally, that plants absorb toxins from closed living spaces, and are being studied for use in space travel. The outcomes of research suggest that common houseplants help to protect your children by absorbing sometimes life threatening toxic gases from your home. Young children are especially vulnerable to toxic petrochemicals partly because of over exposure. And they are more sensitive because they are still developing the basic body systems like the brain, internal organs, respiratory and immune systems that are not fully developed until adolescence. Toxic chemicals normally found in indoor air can interfere with development of these sensitive biological systems of young children causing mild to severe damage which interferes with their ability to learn. Acting like a filter for the air, some plants absorb toxins like formaldehyde. Other species of plants absorb benzene, carbon monoxide, and trichloroethylene. Unfortunately, all of these chemicals are common in the air of most homes. Sources of formaldehyde are found all over the home because it is used in plywood, particle board and glues; and it is found in most cabinets, carpets and walls. Benzene is a petrochemical used in detergents, latex paints, oils, foams, dyes and rubber. It is common in building materials, exhaust fumes, and especially in cigarette smoke. Trichloroethylene is found in paints, lacquers, carpet shampoos, spot removers and adhesives. As a bonus, in addition to removing the undesirable toxins, having plants inside adds oxygen to the air you're breathing. 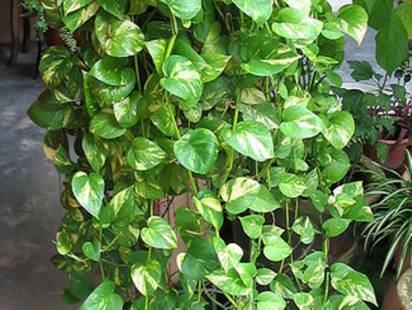 In a 1,800 square foot home, a variety of 15 to 20 house plants should be used throughout. If that seems like too many plants, focus on bedrooms where you spend the most consecutive hours. NASA reports that philodendrons, spider plant and the golden pothos were labeled the most effective in removing formaldehyde molecules. Flowering plants such as gerbera daisy and chrysanthemums were rated superior in removing benzene from the chamber atmosphere. Other good performers are Dracaena Massangeana, and Spathiphyllum. “Plants take substances out of the air through the tiny openings in their leaves,” the scientists say. “But research in our laboratories has determined that plant leaves, roots and soil bacteria are all important in removing trace levels of toxic vapors”. A combination of activated carbon and plant roots have demonstrated the greatest potential for removing large volumes of volatile organics along with smoke and possible radon from homes and other closed systems. The plant's roots grow right in the charcoal, and the roots and charcoal work together to desintegrate the gasses. Additional pictures reveal a wide array of colorful plants to match or vary home décor. Some flowering plants absorb toxins as well as non-flowering plants. A variety of plant species is preferable because the plants tend to specialize in the types of gases that they remove. The following varieties of plants absorb toxins as well as beautify your home. It's also important to open the windows and doors of your home, daily if possible, to allow fresh air to circulate.